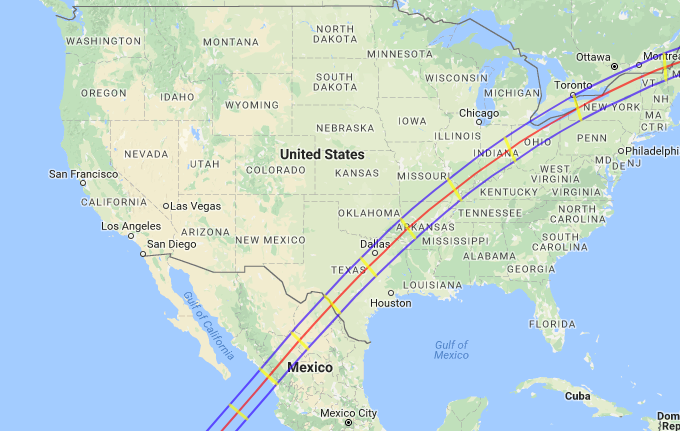 On Monday, April 8, 2024, much of North America will be treated to an eclipse of the sun. From Mexico through Texas and arching northeastward toward Canada, a 100-mile wide section of “totality” will experience a once in a lifetime event as the the moon blocks out the sun and turns the day to twilight. It will get dark enough for street lights to turn on, the temperature will drop and bright stars will be visible in the sky – it will be like night in the middle of day. This event will be seen by millions and eclipse events are being planned all across the country. Our Eclipse Field Guide, a printed pocket field guide assisting parents and educators will ensure their children and students get the most out of this once in a lifetime event. As the countdown clock ticks down, the excitement will grow to a level just a few of the most avid eclipse chasers predicted. Plans for events and celebrations across the country are now taking place. Make sure you find a way to participate. The video features several visualizations of the 2017 eclipse. Everyone in the United States saw the moon at least partially block the sun, but those along the path of totality, shown in red, saw the moon block the sun entirely. During totality, the air cooled, the sky became like twilight and stars appeared. The appearance of the Sun throughout the eclipse is shown for a number of locations in North America, with each Sun image oriented to the local horizon. 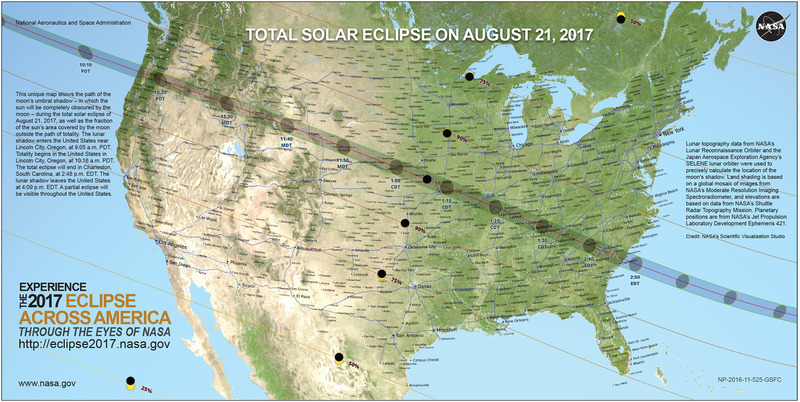 Everyone in the contiguous United States will see at least a partial solar eclipse, while the thin 100 mile wide path of totality will pass through 8 states. This celestial event is a solar eclipse in which the moon passes between the sun and Earth and blocks all or part of the sun for up to an hour and a half, from beginning to end, as viewed from a given location. For this eclipse the longest period when the moon completely blocks the sun will be about two minutes and 40 seconds. The last time the contiguous U.S. saw a total eclipse was in 2017. Times for partial and total phases of the eclipse vary depending on your location. This eclipse map will show you times for the partial and total eclipse for locations all across the country. You can see a partial eclipse, where the moon covers only a part of the sun, anywhere in North America. To see a total eclipse, where the moon fully covers the sun for a short few minutes, you must be in the path of totality. The path of totality is relatively thin, around 100 miles wide, that will cross the U.S. from Texas through Missouri, Ohio, New York and northeastward toward Canada. It is never safe to look directly at the sun’s rays – even if the sun is partly obscured. When watching a partial eclipse you must wear eclipse glasses at all times if you want to face the sun, or use an alternate indirect method. This also applies during a total eclipse up until the time when the sun is completely and totally blocked. During the short time when the moon completely obscures the sun – known as the period of totality – it is safe to look directly at the star, but it’s crucial that you know when to take off and put back on your glasses. The information above does not constitute medical advice. Readers with questions should contact a qualified eye-care professional. Plan ahead – make sure you get your glasses well ahead of time – the entire United States will experience the eclipse and the demand for late orders may exceed supply. Eclipse Glasses – You must use safe, certified eye protection to view the eclipse! Go See The Eclipse: And Take a Kid with You – Astronomy educator Chap Percival is passionate about this eclipse, especially about inspiring children to view it. This occasion will not only provide a teachable moment, it will also be an extraordinary experience that can’t be appreciated through video or photographs. You really do have to be there!